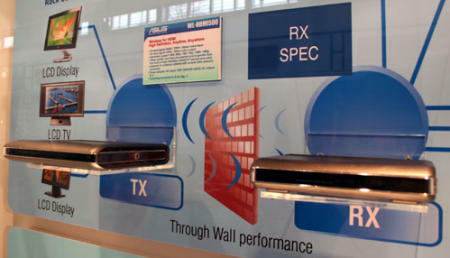 Asus have been showing off the Asus WL-HDMI500 Wireless HDMI transmitter and receiver. The WL-HDMI500 plugs into any device with an HDMI port, and broadcasts the HD signal to any other device with another WL-HDMI500 plugged into its HDMI port. More details of the Asus WL-HDMI500 wireless HDMI after the jump. HDMI is the near-universal interface for virtually any digital audio/video device. It’s used on everything, from DVD players, PCs, Xbox 360s and PS3s, HDTVs, and even camcorders and digital cameras. If you want to transfer high quality audio or video between devices, you use HDMI. Currently, the only way you can do this is through cables. You connect your DVD player, say, to your HD-TV via wires plugged into the HDMI ports of both devices. And if there’s one thing that makes the digital home so unsightly, it’s wires. The more gadgets you have, the more wires you’ll need to connect them all together. With the Asus WL-HDMI500, though, you simply plug one into your DVD player (or whatever device you’re using), and another one into you HD-TV, and you get instant wireless connection between the two devices. You can even store your DVD player in another room, as the Asus WL-HDMI500 transmits and receives through walls! One novel application of the WL-HDMI500 is to connect your laptop to your HD-TV wirelessly without the need for Wi-Fi. Indeed, there’s nothing stopping you from connecting your PC to to your home theatre system, enabling your PC to output videos or tunes and effectively stream them to your home entertainment system. If wireless HDMI transmitter/receivers catch on, they could make dedicated media streamers completely unnecessary. The price will apparently be the same as 10 metres of high quality HDMI cable, which should make the Asus WL-HDMI500 a big hit with people with a huge array of home entertainment devices and a fierce loathing of wires.